With over 60% of patient volume coming from one-time patients visiting Maui, 'new patient' paperwork is an ongoing challenge for Doctors On Call Maui, who see over 30,000 patients per year. Looking for a solution to automate day-to-day tasks and support efficient billing, Doctors On Call Maui turned to CareCloud to provide the "accountability and tracking to help the practice grow". 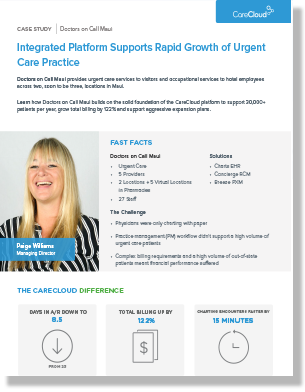 Download your copy of “Client Spotlight: Integrated Platform Supports Rapid Growth of Urgent Care Practice" today! Copyright © 2019 CareCloud All rights reserved.